I count myself among those fortunate enough to have witnessed McLaughlin numerous times and might I add, in a variety of incarnations since the early 1970s. From my first concert with his Mahavishnu Orchestra at Washington, D.C.’s American University (and later on my birthday at Constitution Hall that December); his subsequent Mahavishnu lines ups with Jean-Luc Ponty, Narada Michael Walden, and Ralphe Armstrong; The original Shakti with Zakir Hussain and Al Shankar; organ trios with Joey DeFrancesco and Dennis Chambers; his One Truth Band, his trio with Kai Eckhardt and Trilok Guru; seeing his Remember Shakti tour in Montreal; and so many, many others. 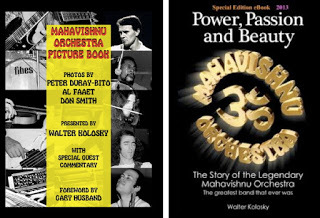 Both books, are a must have for McLaughlin/Mahavishnu fans, the latter featuring footage in both black and white, as well as color; many by the photographers Peter Duray-Bito, Al Faaet and Don Smith. Seeing McLaughlin’s double-neck Gibson guitar, Billy Cobham’s classic clear plexiglass Fibes drums, and Jan Hammer’s vintage keyboards were worth the $10 price tag alone. Coupled with photos of Narada Michael Walden, violinist Jean-Luc Ponty, and the rest of the second incarnation of the Mahavishnu Orchestra were an added bonus. Perhaps just as intriguing was the commentary by so many of the Mahavishnu’s fellow musicians, fans, and photographers who candidly recalled that era, bringing so many memories back to life. I’ll always carry with me my own memories of those bygone, yet unforgettable shows by McLaughlin’s Mahavishnu Orchestra; they made an incalculable impression on me and so many others, and changed the way we looked and listened to music. For more info on Kolosky’s books, photos, and informative podcasts, you can visit http://www.walterkolosky.com/.